2. G.O.Ms.No.01, AHDD &F (AH) Dept., dated: 31-07-2014. 3. G.O.Ms.No.05, AHDD &F (AH) Dept., dated: 29-09-2014. 4. G.O.Ms.No.08, AHDD &F (AH) Dept., dated: 21-11-2014. The Registrar of the University, Rajendranagar, Hyderabad shall take necessary further action accordingly as per TS Veterinary University Act. about: Sri P.V. 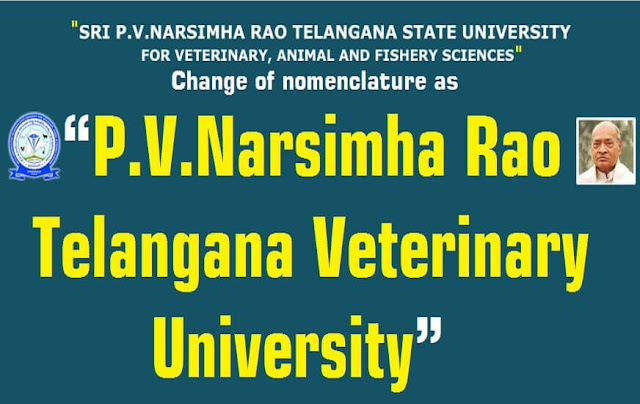 Narasimha Rao Telangana State University for Veterinary, Animal and Fishery Sciences was established by the Government of Telangana on 22.11.2014 with headquarters at Rajendranagar, Hyderabad and brought all the relevant institutes located in Telangana state under the fold of newly formed University duly delineating them from Sri Venkateswara Veterinary University.